“Sharon Waxman has written a compelling page turner about the world of antiquities and art-world skulduggery. She manages to combine rigorous, scholarly reporting with a flair for intrigue and personality that gives Loot the fast pace of a novel. I enjoyed it immensely." "Loot is a riveting foray into the biggest question facing museums today: who should own the great works of ancient art? Sharon Waxman is a first-rate reporter, a veritable Euphronios of words, who not only explores the legal and moral ambiguities of the conflict but brings to life the colorful -- even outrageous -- personalities facing off for a high noon showdown over some of the world’s iconic works of art. Vivid, witty, and delightful, this book will beguile any reader with an interest in art and museums." 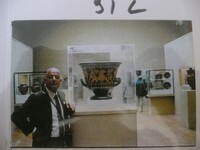 "Sharon Waxman’s Loot is indispensable for everyone concerned with the illicit trade in smuggled antiquities. She exposes the self-serving humbug that too often afflicts both affluent possessors and righteous nationalists and shows that we all have a stake in getting an honest account of how great objects came to rest in our grandest museums." "I sometimes refer to this book as my midlife crisis," joked former NY Times Hollywood reporter Sharon Waxman at the party last week celebrating the publication of Loot, her globe-spanning report on the struggle between museums and national governments over just who has the right to keep and display historical artifacts like the Elgin Marbles or Turkey's Lydian Horde. Instead of buying a sports car, she explained, she went to eight different countries to research her subject, including two separate trips to Paris ("abandoning my children for the summer," she quipped). Once she had a hold of the story, she couldn't let it go: "When there's something I want to figure out," she said, "I'll go figure it out." As we discovered later in the evening, Waxman has been laying the groundwork for a new career as a digital media entrepreneur even while she was honing her classical scholarship skills. Over the summer, she completed a $500K round of seed funding for The Wrap News, "a news and information network covering the entertainment and media industries" that will also draw upon social networking tools to build a community where readers and reporters can intereact in real time. The site is scheduled to launch in just two months; in the meantime, Waxman is still active at her own blog. And so this little experiment draws to a close. I am heading to a quiet place to begin writing in earnest, and will not be posting regularly in this space. I have much enjoyed sharing my discoveries and adventures with you across the ancient world, and have been very gratified by your supportive responses. I will still be checking email for anyone who needs to find me. Thanks for reading, and -- until we meet again. S.
When Maurizio Fiorilli told me Monday that he was close to an agreement with the Getty on the 52 disputed items in their collection, I didn't imagine that they were this close, though he did have a fax from Getty director Michael Brand on his desk with a review of the draft agreement. Today, Elisabetta Povoledo reports in the Times on the Getty's agreement to hand back 40 pieces of its antiquities collection to Italy. She writes: "Full details of the accord were not made public, but the 40 pieces include 26 works that the Getty had unilaterally agreed to return to Italy last November.... A fifth-century B.C. statue of a cult deity usually identified as Aphrodite, one of the Getty’s prized pieces, is among the works to be returned to Italy, the Italian Culture Ministry and the museum’s governing trust said in a joint statement. But discussions on the fate of another statue, a fourth-century-B.C. bronze of a young athlete that was pivotal to the breakdown of earlier negotiations, have been temporarily put aside so that an Italian court can conduct an inquiry on how the artifact was found and how it left Italy in the 1960s." This is a major blow to the Getty, and has to be seen as a significant landmark in the overall tug-of-war between American museums with antiquities collections and source countries such as Italy. Fiorilli made clear to me that this is not the end of the road for Italy's pursuit of items it believes have been looted, though he wouldn't say which museums (or curators) are next on his list. It also raises global questions about the Getty collection, and its ability to feel secure about challenges to provenance. Fiorilli told me that Italy had the evidence to demand the return of 300 pieces, but was contenting itself with this. The end of True's Trials? ROME – Marion True's trial may soon be over, I was told yesterday by Maurizio Fiorilli, one of two state prosecutors leading the case, who is also the man negotiating bilateral accords on restitution with American museums. The two issues are linked. He said he is close to an agreement with the Getty over the 52 items Italy has demanded be returned. (I note that the LA Times has a similar story today.) And he said that once that is accomplished, the trial against Marion True can be expected to come to a quiet close, perhaps as soon as the next two months. He said he would withdraw the civil prosecution, and the criminal prosecutor would be expected to negotiate a jail sentence of two to three years. I was amazed at how explicitly he linked the two actions, making no bones about the fact that True’s trial is a pressure tactic to force the Getty to heel. “This is my experience,” Fiorilli said, pragmatically. “Until today, no American museum has accepted to return artifacts based on the scientific evidence.” Hence: hardball, Italian-style. He confirmed many other fascinating things that I’d learned from other sources. That will have to wait for the book. Here's a very good example of the difficulties posed when you start trying to reset the historical clock, and right old wrongs. This is the famed Piazza Navona in Italy, home of Bernini's sculpted masterpieces. The central monument, the Four Rivers Fountain, represents no fewer than three different epochs: Egyptian, Roman and Pontifical. A description of the monument explains its history and current renovation. But the legend tells us only that the obelisk, of Aswan granite, was found in five pieces in the Circus Maximus. A Latin inscription on the base attests that it was made for Domitius in imperial times (from where? how? a mystery.) It was brought to this spot in the mid-17th century so Pope Innocent X could build himself the most glorious monument in all of Rome on this piazza. And this Bernini did. Can this piece be deconstructed at this late stage? If Egypt were to reclaim the obelisk, what would become of the Bernini marble colossi, representing the four rivers of the world? I note this only because Rome has a surfeit of obelisks, and Egypt almost none, although it is also worth noting that Zahi Hawass seems to be giving Italy an utter pass on plundered antiquities. In any event, there are 13 obelisks in Rome alone, and far more today in Italy than in Egypt. 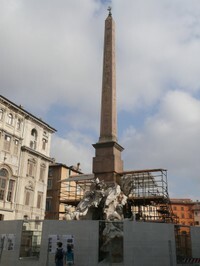 (Here's chapter and verse on Rome's obelisks. Egypt now has seven.) I'm getting a little obsessive: I did a tour of Rome's obelisks (on scooter, a most pleasant task) and found five without much trouble, not including in Vatican square, which I missed. They are of different sizes, and were brought to Rome at different times. There used to be, until recently, an Ethiopian obelisk, taken by the Italian army during its occupation of that country in 1937. It was returned to Ethiopia in 2005. Well, at least that's a start. Schultz, that is, who I hope is reading along. Howard, dearest: Starbucks in Egypt. Starbucks in Turkey. Starbucks in Greece. Now I'm in Rome: No Starbucks! I'm beginning to worry about you guys. I spoke briefly by phone yesterday to Marion True, the former Getty curator now dangling in the legal winds in Italy and Greece. And I spoke at great length to her friends, dotted around the island. Every story has two sides. Yesterday I heard the story of a much respected, widely beloved scholar who devoted 23 years of her career to improving the Getty’s poor reputation in the museum world by aggressively promoting scholarship, funding conservation all over the ancient world (the Sphinx, for example, in Egypt), giving poorly-paid Greek archeologists grants to study at the Getty institute, holding colloquia like the one to investigate the authenticity of the Getty’s disputed kouros (bought before her time). Her acquisition decisions were reviewed by a scholarly steering committee and approved by the museum director. It was True, they say, who pushed the Getty trustees to announce they would stop buying antiquities in the mid 1990s, because she felt it fed the smuggling trade (her critics say the Getty conveniently did this only after acquiring the Fleischmann collection, a largely unprovenanced group of treasures). Now, the friends say, she has been hung out to dry. That much appears to be true. 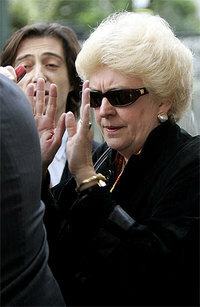 The Getty is paying for her team of 5 lawyers, but have urged her to keep quiet and not defend herself. Her friends say the Getty’s aim is to protect the Getty, not True. It is a tragic tale, however you slice it: either the insidious corruption of a Harvard-educated, lover of history by the prevailing norms of a see-no-evil antiquities trade. Or the public crucifixion of a competent curator who played by the rules – and the rules lived in a grey zone -- and then found herself in the cross-hairs when the rules changed to black and white. No one in Paros, even those who don’t associate with True, think there is any substance to the charge that she had looted antiquities in her Paros home. And yet there are looted antiquities in the homes of wealthy Greeks, all over the country, who are essentially untouchable. I have been thinking a lot of what it must feel like to be Marion True, of the crushing of an individual when institutions collide. Is Marion True corrupt, or is the entire system corrupt? Her friends say she has, at points, been suicidal. There is a visible human cost to the tectonic shifts in the world of patrimony and cultural identity. PAROS, Greece – The sun is quickly sinking over the bay of Paros, a honey-orange ball easing its way beyond the undulating hillside of this island. The light has cast a pinkish hue over the water, while a huge ship – Blue Star Ferries – slides into the port, with tourists mainly eager to mount scooters and head for the beaches. But Paros is a center of antiquity, home to many rich archeological sites, many of them fairly recent finds. Still, it’s most famous as the source of the finest marble used in the ancient world, a pale translucent stone which allows light to reflect from within. Parian marble was used, for example, for the Venus de Milo, the Winged Victory of Samothrace, and many other monuments (including many by Praxiteles, whose exhibit was inaugurated last night in Athens). Paros is also the place where Marion True, the former curator of the Getty, has her second home. I am here to learn more about True, how she is viewed now that she is accused of a crime. For many years True mixed with high society, befriended the local archeologists and collectors alike, doling out grants and buying for the museum. Last year her home here was raided by police, who claim to have found illegal antiquities there. True says the pieces were in the home when she bought it, apparently a common custom around here, and that she’d informed the authorities when she bought the house. Few are willing to associate with her today. As one former friend said, anonymously, told me: “Well, when you have power, you have many friends….” Still on trial in Italy for related alleged crimes, True comes to Paros, but is seldom seen.